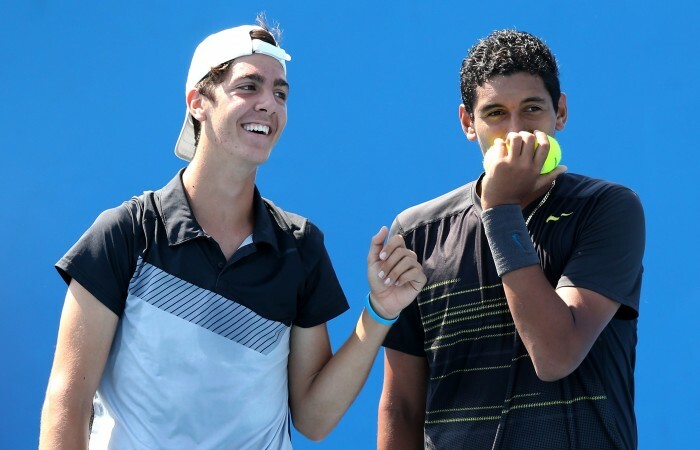 Newly-crowned world No.1 Nick Kyrgios and his doubles partner Thanasi Kokkinakis have made their way into the third round of the 2013 Australian Open junior boys’ singles tournament. Newly-crowned world No.1 Nick Kyrgios admitted to nerves in his first match as the world’s top-ranked junior but it did not stop him from winning his way into the third round of the 2013 Australian Open junior boys’ singles tournament. 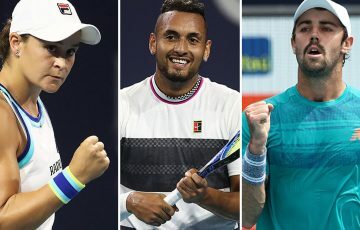 Kyrgios defeated New Zealand’s Cameron Norrie 6-3 6-1 to be one of three Australian boys’ singles winners on day four of the junior competition, along with wildcard entrants Thanasi Kokkinakis and Omar Jasika. Kyrgios made short work of Norrie on Show Court 3, winning in 52 minutes. “I probably didn’t play my best tennis today but I’m obviously glad to get the job done,” Kyrgios said. Kyrgios’ next opponent is countryman Jasika, who stormed into the third round with a 6-3 6-2 win against Japan’s Naoki Nakagawa. 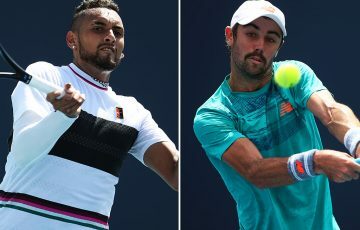 “I’ve played doubles with him and I am good friends with him, so it’s going to be tough, but I have to treat it like any other match,” Kyrgios said. Kyrgios later teamed with Kokkinakis to upset No. 3 seeds Robin Stanek of Czech Republic and Filippo Baldi of Italy 6-3 6-1 in a boys’ doubles second round match. Australian pair Jay Andrijic and Bradley Mousley also won through to the boys’ doubles quarterfinals, upsetting fifth-seeded Canadian pair Hugo Di Feo and Brayden Schnur 6-3 7-5. Jasika could not back up his singles win in the doubles, he and partner Blake Mott lost to German Maximillian Marterer and Austrian Lucas Miedler 6-4 6-4. Earlier in the day Kokkinakis fought back after losing the first set to defeat big-hitting Stanek in their second round singles match, winning 2-6 6-4 6-3. 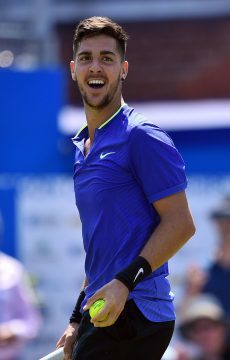 Kokkinakis was impressive, recovering from a break down in the second set, to score a victory in front of a crowd that included Australian tennis legends John Newcombe and Tony Roche as well as top women’s double player Czech Lucie Hradecka and pop star Red Foo from LMFAO. Kokkinakis, who next faces Frenchman Enzo Couacaud, said his confidence was at an all-time high. In other boys’ doubles action, Australian duo Daniel Guccione and Jacob Grills bowed out of the tournament, beaten by Couacaud and his Italian partner Stefano Napolitano 6-3 6-4. The results were not so good for the Australian girls, with Danielle Wagland and Olivia Tjandramulia both knocked out of the girls’ singles tournament. 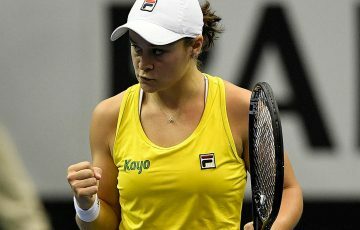 Wagland lost to Russian Elizaveta Kulichkova 6-1 6-2, with Tjandramulia beaten by No. 2 seed Katerina Siniakova of Czech Republic 6-0 6-2. 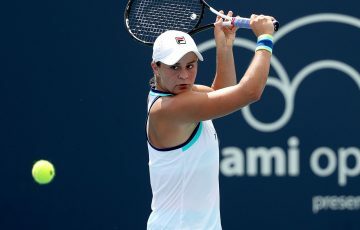 Australian pair Samantha Harris and Astra Sharma were eliminated from the girls doubles competition, beaten by Romanian Ilka Csoregi and Serbian Ivana Jorovic 6-4 6-2, as were Sara Tomic and Brooke Rischbieth, who lost to No. 8 seeds Camilla Rosatello of Italy and Ipek Soylu of Turkey 6-3 7-5. Naiktha Bains and Danielle Wagland were also defeated 6-3 6-2 by fifth seeds Anna Danilina from Kazakhstan and Russian Elizaveta Kulichkova.